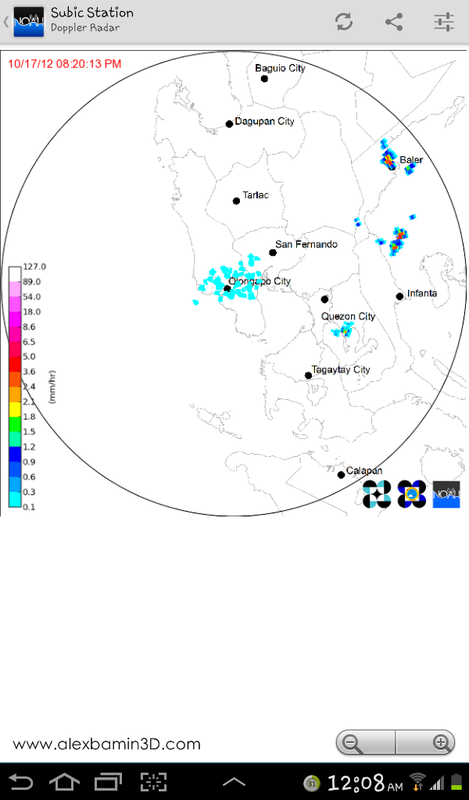 In this modern technology, the Philippines needed to step up a notch in their service of providing accurate and real-time weather updates to the public. 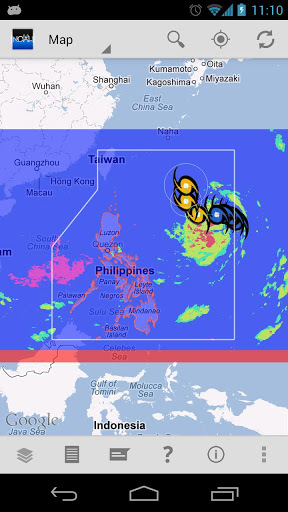 The Philippines hits by an average of 20 or more typhoons per year, and up-to-date reports are essential for everyone's safety and prevention of a more devastating result of this & other natural calamities. 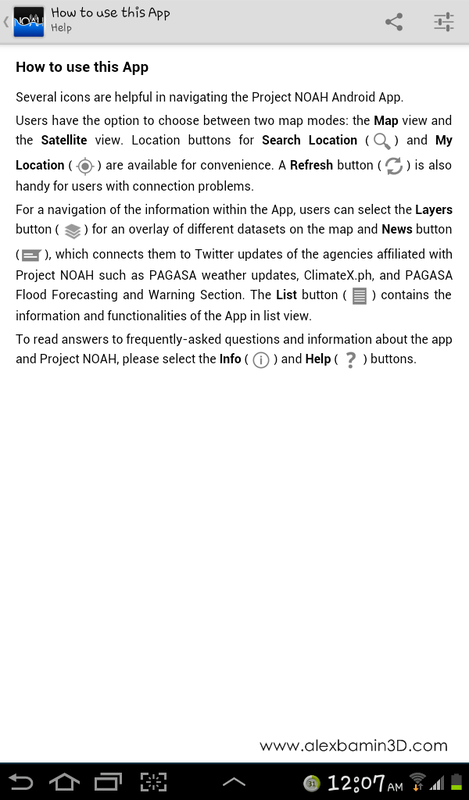 The Department of Science and Technology (DOST) in partnership with Smart Communications, Inc. developed "NOAH" mobile application, an app that is able to access on-time weather information from PAGASA-DOST and Project NOAH (Nationwide Operational Assessment of Hazards). 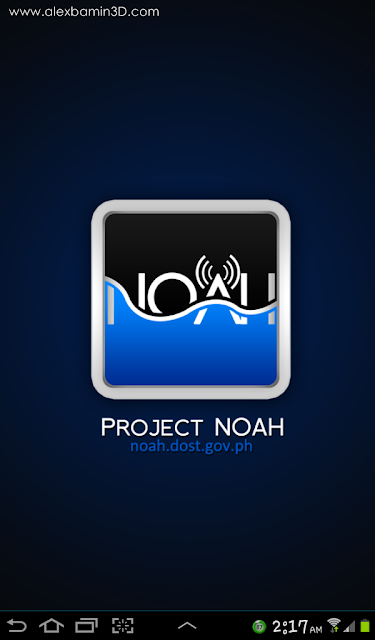 NOAH's immediate task is to integrate current disaster science research and development projects, and initiate new efforts within DOST to achieve this objective. Project NOAH aims in providing high-resolution flood hazard maps, install 600 automated rain gauges, and 400 water level measuring 18 stations, other river basins in the country will soon to follow after the first 18 stations. Almost same with Map View but presented as list for ease of use. 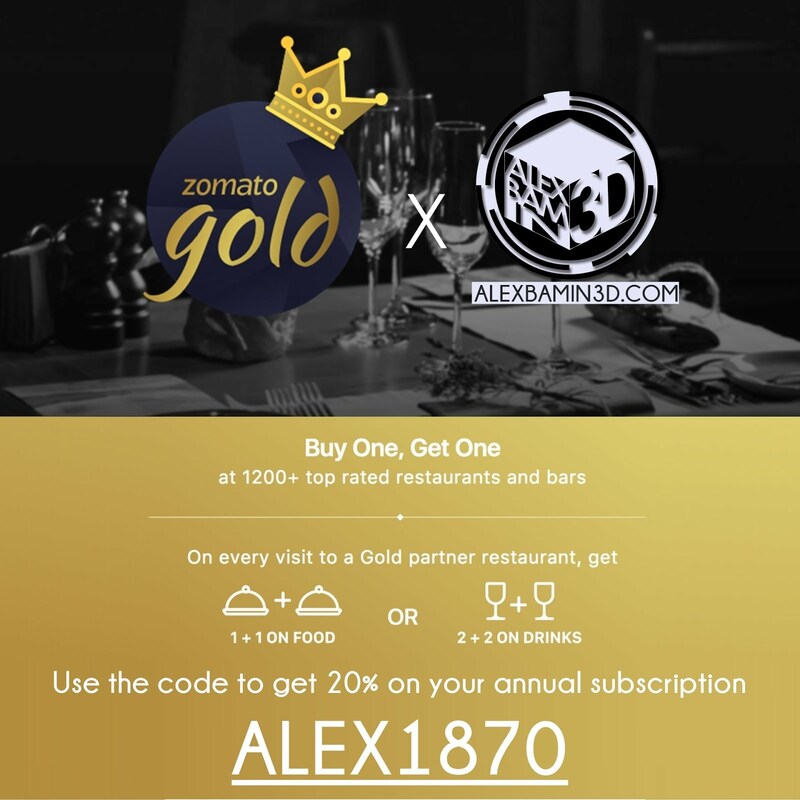 The interface of this application is quite minimalist as it shows a top and bottom menus leading you to the different functions of the application, an instruction on how to use the app is also available for first time users. 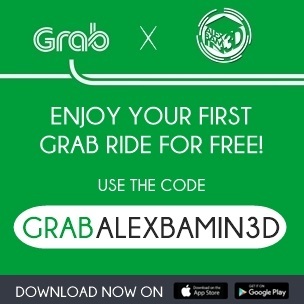 When I first installed this on my Samsung Galaxy Tab 7.0 Plus it worked like a charm over my WiFi connection, but a little bit slow if you use data connection, please note that you need to have a decent internet connection to use this app as it needs the connection to bring you real time reports and graphics. 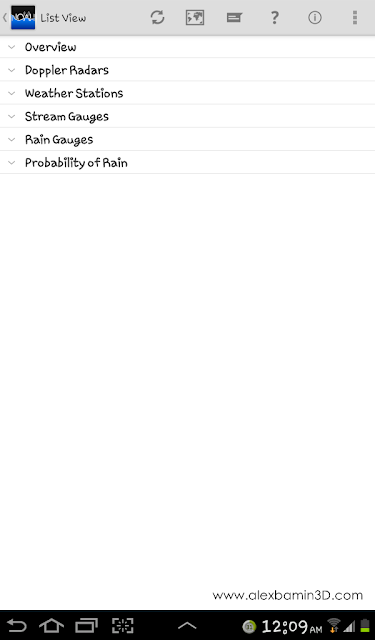 A menu showcasing the different function like Doppler Radar images from different stations, Weather stations, Stream gauges, rain gauges, and rain probability option can be found on the menu of this application. 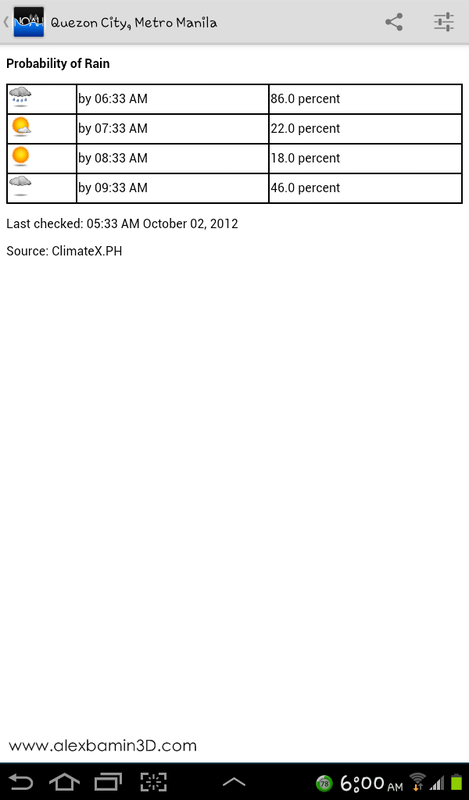 It also uses your device location to bring you accurate forecast for your area. 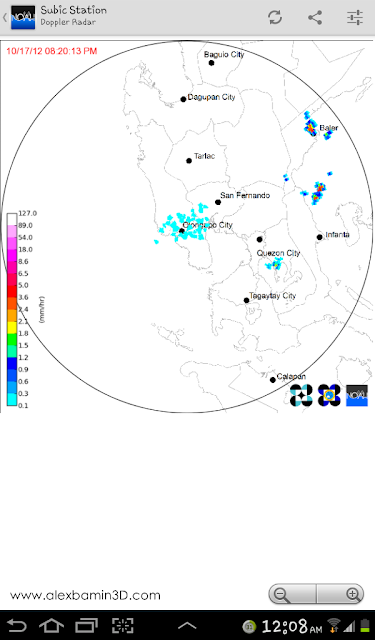 One of the most interesting feature of this application is the Doppler Radar images which shows most recent captures of the Doppler Radar in your chosen station, I used Subic station in this images as it is the one that captures the Metro Manila Area. I only experienced one problem when I tried out this feature for the first time - my tablet hanged and the app crashed, but after a little restart, the feature worked smoothly. Emergency hotlines are also taken into consideration in creating this app, making it a lifesaver for emergencies, it features the hotline numbers of NDRRMC up to the Manila Water Hotline. 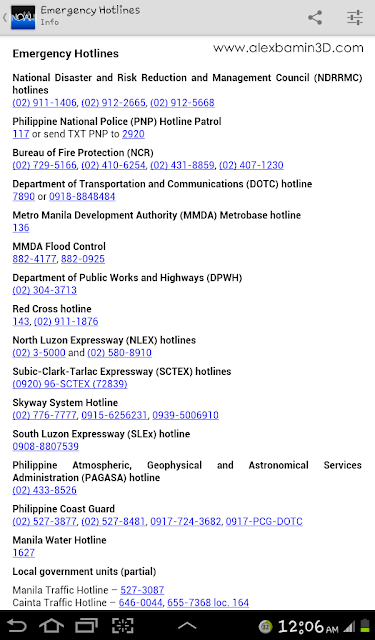 I find this feature really really useful in times of emergency, every contact numbers are accessible just by one tap. 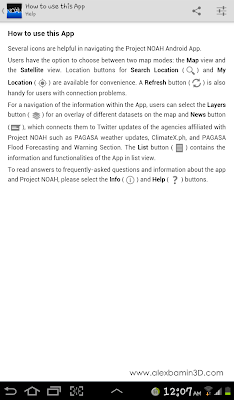 Another application that came or can be paired with the Project NOAH app is the FLOOD PATROL app, it helps people to know the latest flooded areas by using a crowd sourcing technique where information gathered are sent to Project NOAH for flood mapping. 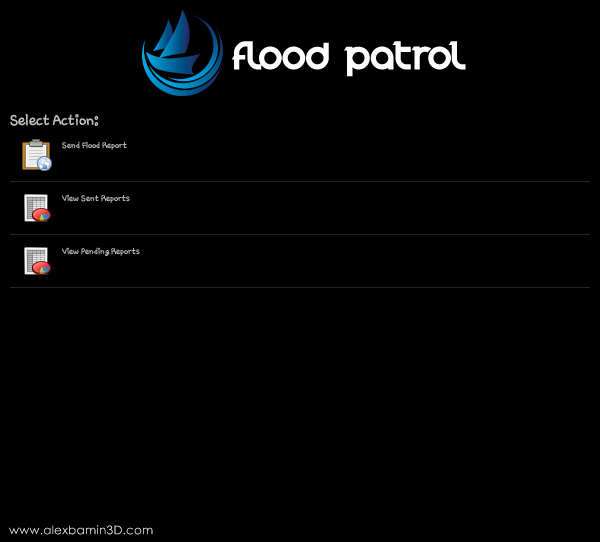 It features a simple interface when you open it which shows you Action options - You can report & check flood reports, options (currently for administrators), and know more about the app. Users can report floods in their area and this will be used for flood analysis and disaster management, those using the app can also view (approved) reports by other users of the app. This helps in a more faster public flood mapping in times of typhoons and calamities. 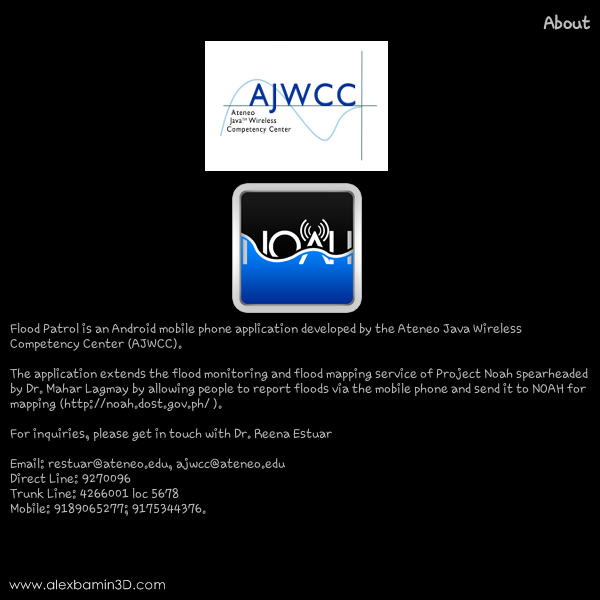 This application is developed by the Ateneo Java Wireless Competency Center (AJWCC) and DOST. Overall, the two new apps developed by DOST and partner groups are very much needed right now by the ever so growing 'techie' crowd of the Philippines, it also helps us to be more proactive in times of disaster and calamities. I really look forward to it's improvements in the future as more people sends problem reports and bugs to the developers. The Project NOAH application is now available for public download on Android devices via Google Playstore starting today.  for letting www.alexbamin3D.com to experience trying out this very helpful application.